I'll post your thoughts and mine on Monday. Some other aspects of the question to consider: How will developments like Buy Local First, Slow Food, and the organic movement affect bookselling, if at all? Will author tours mean that writing will become more performative, and how will that affect bookstores? What will the bookseller of the future look like, or is there room for both the businessperson and the idealist? Thinking outside the chain vs. indie question, how will all bookstores be changed by new technologies, new demographics, new forms of literature and information? Can we even make viable general predictions about a retail landscape as vast and varied as that of the United States, and if not, what can we predict on a local level? On a larger scale, what did we read/use before the book, and what might come after the book? 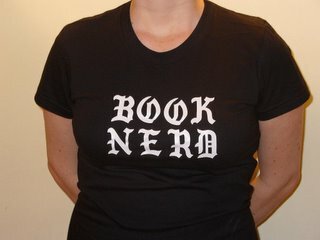 Interrogate your bookish friends, or your non-bookish friends. Quote the experts. Speculate wildly. Looking forward to reading your thoughts. See you Monday!